SNOEL'S BLOG: Porters speed up! 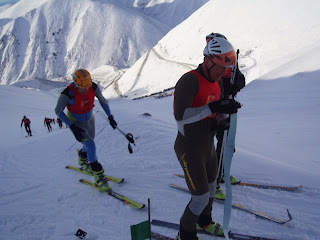 Ok today was the first race of the SkiMonNZ 2008 series, and as predicted I came 5th. In balance there were some highs and lows during the race, but in general it was a fantastic experience. Firstly it was great seeing everyone from the series last year with a few notable missing persons such as Gary McPherson (Queenstown). Everyone looked fit and well and ready for a fast race. The course was three short laps. The longer first one was only 100m, then two laps of 85m, so it was going to be quick. Right from the word 'go' we were off and running. Gena, Duncan then I all ran to the first skin track, then settled into that order for the first climb, although Duncan passed Gena going into the first transition, but then had a slower transition down the bottom, allowing Gena to re take the lead, and then I passed Duncan during the second lap (things were looking good at that stage, but not for long!). After the skiing down for the third lap I put my skins on for the last up hill and my right skin was frozen, and just wouldn't stick. 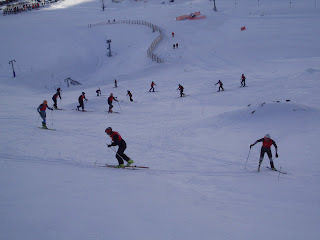 I kept going, but the problem caused me to slip back, slow and then finally towards the top of the 85m lap I was reduced to taking my skis off and running! At that stage Tim, Duncan and another guy called Nigel flew by and I came in 5th. It was all over for me in about 27minutes. Gena was impressive with really good consistent transitions and just heaps of power. He Lent me a race suit, which was pretty hilarious. Start packing 2 sets of skins and you'll be top 3 for sure! Loving the blog. Good to see everyone out on the weekend and your debut in the lycra suit!! Is that a a stretch or some kind of secret training technique? Yeah thanks Tim. I've got to say that the suit was good, I didn't get totally overheated as I normally do. Mind you there is only one way to really know for sure!! !